In 2006 a cooperative Japanese-Chinese science organization, the Japan International Cooperation Agency (JICA), began a project to measure the atmospheric boundary-level flux near Erhai Lake in Yunnan province in China. 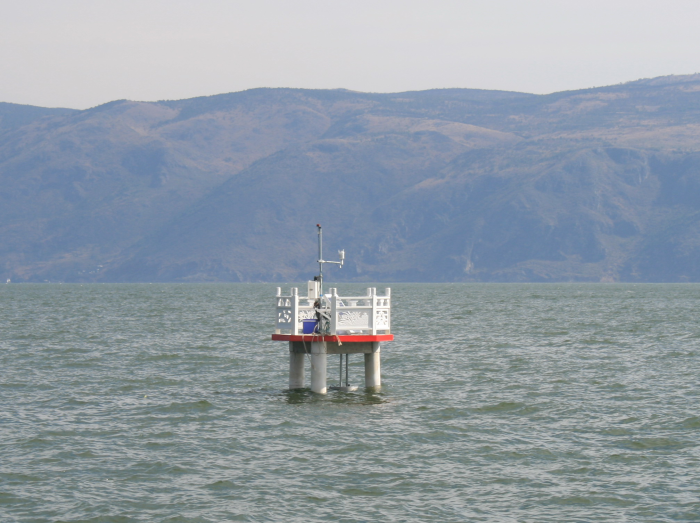 To correct for the influence of the large lake on the flux measurements, a combination hydrological-meteorological station was installed out on the lake in January 2008. The station was required to be solar powered, communicate via GPRS modems, and not detract from the natural setting. Beijing Techno Solutions was chosen to design, integrate, and install the system. Their engineers designed the site structure to be an attractive part of the scenery, and the beautiful, carved panels hide most of the technical gear. The system started with a Campbell Scientific CR1000 datalogger at its core, installed in a weatherproof enclosure mounted on a mast. Beijing Techno Solutions then chose a WXT510 from Vaisala to measure wind speed and direction, atmospheric pressure, and precipitation with a single instrument. To measure dissolved oxygen, pH, algae, and conductivity in the water, Beijing Techno Solutions chose an MS5 sonde from Hydrolab with several sensors bundled together in one product. The engineers also designed a special floating mount to suspend three PT100 water temperature probes positioned 30 cm, 100 cm, and 200 cm below the lake surface. (See photo below.) The data from all of these sensors is collected by the CR1000 and transmitted to researchers on land. With no access to land lines for power or communication, the system was set up with a solar panel for power and a GPRS modem for wireless communication. The data has been flowing for over a year, and Beijing Techno Solutions is providing support and training for ongoing rations. The engineers also designed a special floating mount to suspend three PT100 water temperature probes positioned 30 cm, 100 cm, and 200 cm below the lake surface. The data from all of these sensors is collected by the CR1000 and transmitted to researchers on land. With no access to land lines for power or communication, the system was set up with a solar panel for power and a GPRS modem for wireless communication. The data has been flowing for over a year, and Beijing Techno Solutions is providing support and training for ongoing operations.